One time, when there were fires in Cajon pass and I could not go home to get more work clothes. I went this route and hiked home to the village. Got my clothes and drove to work in my Bronco II. Then I had a friend drive back up to get my truck. You should hike this route, just for the beauty of it L.B. 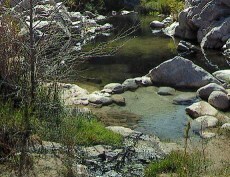 Stop and admire the spring about 1/2 mile and on the right hand side before the creek. It is good to start out in the forest and hike into the desert. I also saw deer on this route a few times. Wish I could go w/you.